The neighborhood offers easy access to Downtown Boston with numerous transportation options including the Blue Line MBTA at Maverick Square Station and Airport Station, seven (7) MBTA Bus Stops and highways I-90, I-93 and Route 1. Additionally, the Boston Logan International Airport is just a few minutes drive. 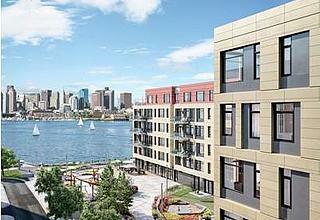 East Boston is its own peninsula with waterfront property along the neighborhood’s edges. 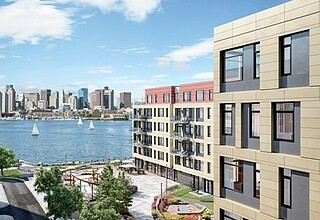 Removed from the commotion of the bustling city, East Boston’s tranquil neighborhood, welcomes young professionals and families. Luxury residences are tucked between surrounding parks and recreational spaces and are just a short distance to Boston’s Logan International Airport for travel to and from the city. Grocery stores and shops are interwoven in the neighborhood. Paths along the waterfront give residents scenic walks and runs peering out to the Boston Downtown skyline, making East Boston its own peaceful neighborhood just outside the city.